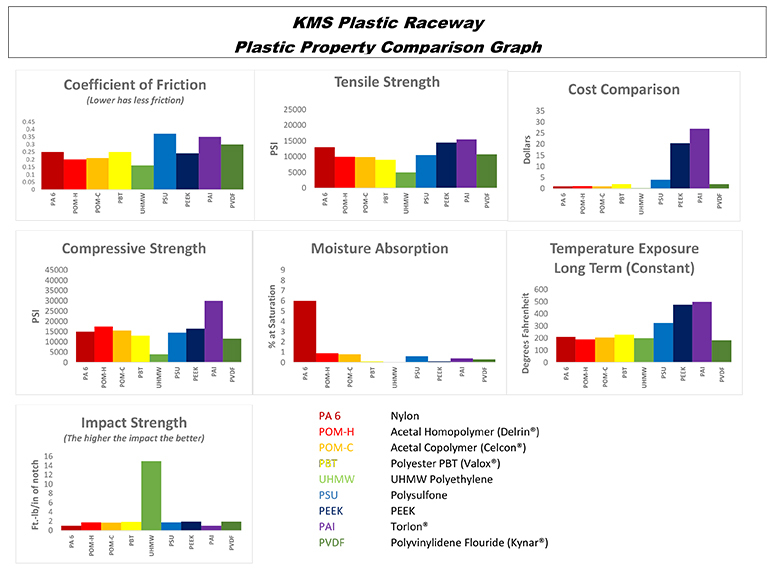 A standard KMS Plastic Ball Bearing is made from Celcon® Acetal (POM) for races and ball retainer. When the standard material is not the right fit we have additional standard materials, Kynar® and PEEK, which offer additional benefits. Celcon® Acetal POM (Polyoxymethylene) is a superior general purpose engineering polymer that provides an excellent balance of desirable properties that bridge the gap between metals and ordinary plastics. Click here for Celcon® Acetal Plastic Radial Ball Bearings. Kynar® provides superior chemical resistance properties in critical contact applications for food, pharmaceutical and semiconductor industries for over 20 years. Kynar® applications include membranes, piping, tubes, valves, pumps, vessels, and now BEARINGS. Click here for Kynar® Plastic Radial Ball Bearings. PEEK (Polyetheretherketone), is a high heat, high performance engineering polymer for use when the Standard Celcon® Acetal Polymer does not meet the performance requirements of the application. PEEK offers chemical and water resistance similar to PPS (Polyphenylene Sulfide), but can operate at higher temperatures. PEEK can be used continuously to 480°F (250°C) and in hot water or steam without permanent loss in physical properties. Click here for PEEK Plastic Radial Ball Bearings. Polypropylene Radial Ball Bearings are a semi-custom alternative for higher chemical resistance applications at lower load and speeds. Polypropylene is an economical structural type polymer that offers a combination of outstanding physical and chemical resistance properties. Polypropylene provides excellent resistance to organic solvents, degreasing agents and electrolytic attack. It is light in weight, resistant to staining, and has a low moisture absorption rate. This is a tough, heat-resistant, semi-rigid material, ideal for the transfer of hot liquids or gases. It has excellent resistance to acids and alkalines, but poor resistance to aromatic, aliphatic and chlorinated solvents. As a ball bearing race material it is a low cost alternative for those applications with lower speeds and loads needing improved corrosion resistance over the standard Acetal. Valox® offers the mechanical performance of Acetal with superior chemical resistance. Valox® polyester resin is a semi-crystalline material based on polybutylene terephthalate (PBT). Valox® resin combines heat and chemical resistance, as well as outstanding electrical properties with exceptionally good process-ability and surface appearance. Resistance to a variety of chemicals, including hydrocarbons, dilute acids and bases, detergents, and most aqueous salt solutions. Good Temperature Performance - Relative temperature index (RTI) up to 284 °F (140 °C), and provides good low temperature performance to -40°F (-40°C). Click here for VALOX® PBT POLYESTER Plastic Radial Ball Bearings. UHMW-PE is self-lubricating, shatter resistant, long-wearing, abrasion and corrosion resistant. It meets FDA and USDA acceptance for food and pharmaceutical equipment and is a good performer in applications up to 180°F (82°C) as a bushing/sleeve type bearing and 130°F (55°C) for a ball bearing race. Can be periodically cleaned with live steam or boiling water to sterilize. UHMW-PE is used in many wear parts in machinery and equipment as well as a superb lining in material handling systems. It is ideal for use in plastic ball bearing applications requiring superior abrasive and chemical resistance. UHMW-PE bearings can only be manufactured by machining from rod stock. Further consideration will need to be given for wide tolerance ranges due to the nature of the material with thermal expansion and contraction characteristics. Minlon® is registered trade mark of the Dupont Corporation. Zytel® is registered trade mark of the Dupont Corporation. Torlon® is registered trade mark of the Solvay Advanced Polymers. Kynar® is a registered trade mark of the Autochem Corporation. Celcon® is a registered trade mark of Celanese Corporation. The use of the above trademarks is not an endorsement or affiliation with KMS Bearings. * This chart is for reference only. KMS recommends testing in actual environment to be encountered. Information presented is believed to be accurate at the time of publication and is subject to change without notice. No warranty, either expressed or implied is given regarding the accuracy of this information. The user assumes all risk and liability in connection with the use of KMS information. * This chart is for reference only. It is a snapshot comparison reference. KMS recommends testing in your actual environment to be encountered. Information presented is believed to be accurate at the time of publication and is subject to change without notice. For additional information on the materials available please go to PDF Library.